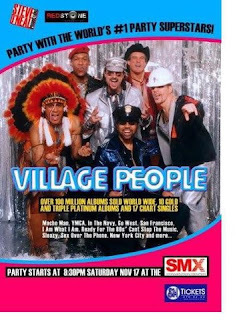 Catch The Village People in Concert at the SMX Convention Center this November 17! Walk down memory lane and relive the great hits IN THE NAVY, MILKSHAKE GO WEST, I AM WHAT I AM, CAN'T STOP THE MUSIC, YMCA plus more record breaking singles that spearheaded disco revolution for over three decades! Get your tickets now at https://www.smtickets.com/marketing/view/878 Mark November 17 on your calendar and see The Village People at the SMX Convention Center live! This spectacular event is brought to you by Red Stone media Productions, in cooperation with Jinga Juice, Puerto Princesa underground River, Esquire Financing Inc., Talk TV, 2nd Avenue, Jack TV and Media Partners: The Philippine Star, Business World, Business Mirror, People’s Journal, Mellow 94.7, Barangay LS 97.1, 101.1 YES FM, and Pinas FM 95.5. And since it's More Fun To Do the YMCA, our generous friends from Red Stone Productions is giving away tickets [valued at 3500 pesos each] to my followers! One winner will be chosen from facebook and another from twitter. More shares means more chances of winning! Comment on this contest post with your name, e-mail address, Twitter ID, Facebook name, GFC, name used to follow on Networked Blogs plus links to your Twitter and/or Facebook posts. Deadline of entries is on November 15, 2012 at 9AM. The Village People are one of the icon of the Boy bands..will be excited the watch the show.. Thanks for joining! Congratulations to Ricalyn Sicad (twitter winner) and Kyle Madrid (FB winner)! Please check your email and twitter DM for instructions on how to claim your tickets later at SMX.